Wellington Phoenix have surprised perhaps even themselves on their way to the top of the A-League. Ernie Merrick has, deservingly, received much of the credit for their rapid ascent. Appointed in 2013 following the departure of long-serving Ricki Herbert, Merrick appeared on paper, a sensible choice. He had vast experience in the league and won multiple titles with Melbourne Victory, and seemed well suited to the long-term project proposed by Phoenix owner Gareth Morgan to give the side an “identity” – that is, a discernible playing style. After eighteen months, or a season and a half, that style is now very obvious. There is an emphasis on building through the thirds, which means the defence builds up from the back to play into the midfield, who then look to distribute the ball into the final third. Wellington don’t actually dominate possession as often as one might expect (averaging 48% for the season), but they’re very effective and efficient on the ball. They have, to illustrate the point, converted more of their shots into goals than any other side with the exception of Melbourne Victory. While this strategy is fairly orthodox, Wellington’s formation is less so. Merrick has been the most fascinating coach in the league this season, constantly adjusting his side’s shape in reaction to both injuries, suspensions and the opposition. He also seems keen to constantly evolve the side, as if wary of complacency and perhaps too of the lack of depth in the squad – unpredictability in terms of formation has helped to mask a certain predictability with team selection. The one constant to his formations, however, has been an emphasis on creating overloads in midfield. The lynchpin to this has been Michael McGlinchey, signed in the winter of 2014 after a protracted transfer saga with his former club, Central Coast Mariners. As it has turned out, though, it was probably worth the wait. McGlinchey has predominantly been used upfront in a 4-3-3 formation. Rather than being a typical number 9, however, who traditionally led the line with physicality and made runs in behind, McGlinchey is a false 9, meaning he starts in that advanced position, but moves into deep positions, often dropping into midfield to receive possession. He is, in effect, a number 10, with the crucial difference being that he starts high up the pitch. This means when he drops vertically into those positions between the lines, he causes confusion for the defenders – do they mark tight to him and risk leaving a hole in the defence, or do they let him go free and risk him receiving passes between the lines? It’s a difficult dilemma, and one that has confounded many A-League teams this season – most notably against Melbourne City, where McGlinchey ran riot in a 5-1 win. Here, we’ll look at some more recent examples. In this example, McGlinchey (circled in yellow) has moved into the midfield zone to receive a pass from Albert Riera. As he has started high up against the Newcastle back four, then dropped deep, he has drawn the attention of centre-back Daniel Mullen, who moves forward to close him down. This creates a disorganised back line, as can be seen in the second image. Nathan Burns, the right winger, looks to take advantage of this by running in behind from a wide position. This is the trademark move associated with a false nine, with the wingers making penetrating runs in behind to provide the goalscoring threat that would otherwise be absent. In this scenario, McGlinchey does not make the pass, but the danger is obvious. This is another example of how the false nine’s vertical movement can create a disorganised opponent. In the first image, McGlinchey is alone in acres of space between the lines, about to receive a pass from Riera. When McGlinchey takes his first touch, Adelaide centre-back Nigel Boogaard has moved forward to close him down. That has created a gap in the defence for Nathan Burns to sprint into, as depicted on the second image. Returning to the Jets game, we have another example of how the false nine creates space for wide players to make penetrating runs in behind. In the first image, McGlinchey receives a short forward pass from Riera, with Taylor Regan immediately looking to close him down. That opens up space in the channel between Regan and his left-back into which Roy Krishna makes his run in behind. The second image shows how McGlinchey’s pass finds Krishna in behind – the Fijian crosses low for Burns in the box, who inexplicably misses with an woefully poor backheel. Still, the perks of a false nine are obvious. Turning to more recent fixtures, Merrick made the surprising decision against Perth Glory to switch Bonevacia and McGlinchey’s positions. This made the 4-3-3 more of a 4-4-2 diamond, as Bonevacia tended to start in the no.10 position (rather than high up as a striker, as McGlinchey does). When Bonevacia vacated that space, however, McGlinchey moved forward, causing problems with his positioning between the lines. It was essentially the false nine movement in reverse, but rather than dropping deep, McGlinchey was now moving forward to find space between the lines. The principle was still the same, however – to create overloads in midfield, disorganise the opposition back four and create gaps for the wide forwards to make penetrating runs in behind. Here, McGlinchey (circled in yellow) has moved forward into the no.10 position, with Bonevacia having rotated into a deeper midfield role. Perth centre-back Dino DJulbic has anticipated the pass from Joel Griffiths into McGlinchey and moved forward to intercept – however, McGlinchey lets the ball roll across his body. This creates space between the lines from which he feeds Krishna in behind, as highlighted in the second image. 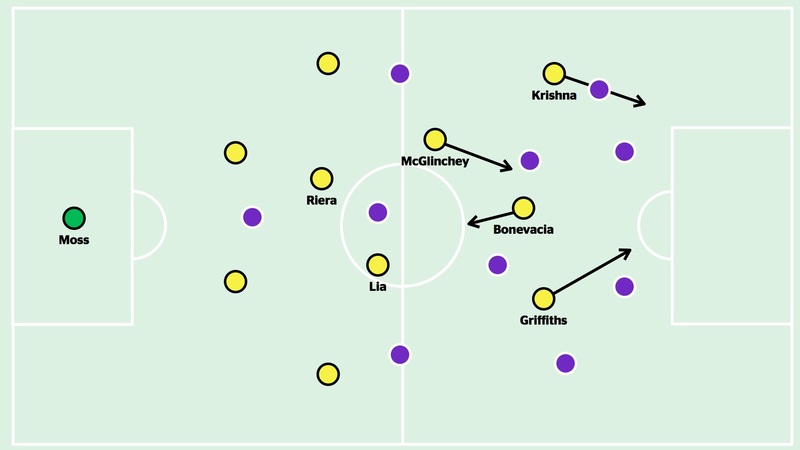 Here, Bonevacia has moved slightly deeper to allow McGlinchey to push higher up, into a position in front of Josh Risdon. 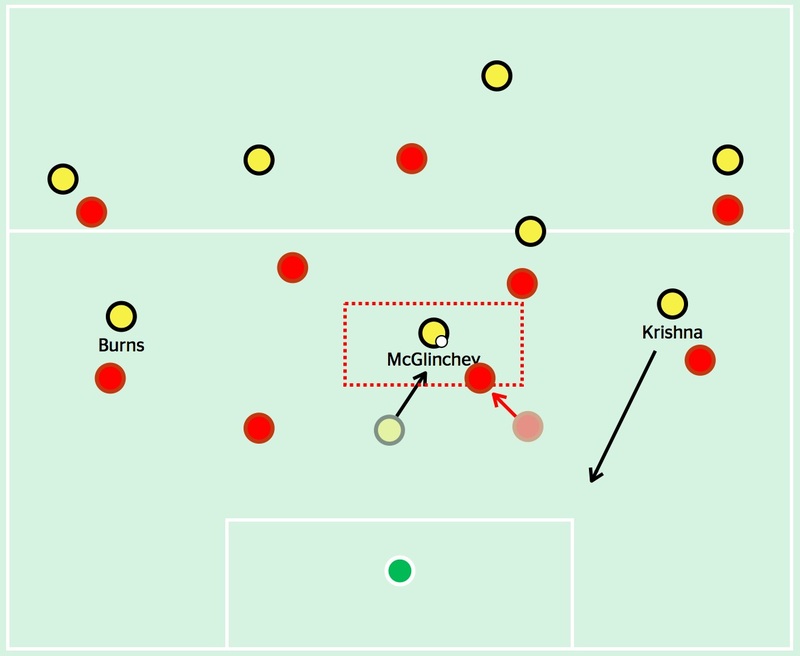 As the pass is played into McGlinchey, Risdon moves forward, creating space for Krishna to run in behind Djulbic, as seen in the second image. Unfortunately, McGlinchey’s first touch breaks the move down. McGlinchey isn’t the first false nine in A-League history. The first exponents of the model, sporadic one-offs from Melbourne Heart aside, were Melbourne Victory, when in 2013 Ange Postecoglou implemented a 4-2-2-2 formation with two false 9s, Guilherme Finkler and Marcos Flores. Later, when Finkler suffered a long-term knee injury, Postecoglou used Flores as a lone false 9. The following year, Mike Mulvey used Thomas Broich upfront against Victory. The German was magnificent, constantly dropping into pockets of space between the lines and dictating the Roar’s attacking play, leading them to a 3-0 win. We’ve also seen intermittent false nines by other clubs, including Cirio for Adelaide United, and Harry Kewell for Melbourne Heart. Should the false nine, given its relative success, be more commonplace? It feels as if the system only suits a side that dominates possession, where the ball is moved forward patiently and there is time for the false 9 to drop deep from his starting position and find space between the lines. A team that plays more directly requires that classic, physical number 9 to hold up long balls, while in a more counter-attacking side, the false 9 can be bypassed altogether – in that situation, a player that runs in behind is more suitable. That might explain why when coming up against teams likely to have more possession than the Phoenix, Merrick tends to change his shape, positioning McGlinchey in a different role such as the one described above in the match against Perth Glory. Merrick made similar tactical changes against Brisbane Roar and Adelaide United. Nevertheless, that remains the exception rather than the rule. Wellington have become a clever, exciting, technical-based side under Ernie Merrick. McGlinchey is their leader – driving them forward from the front, but ironically, dropping back into midfield to do so.